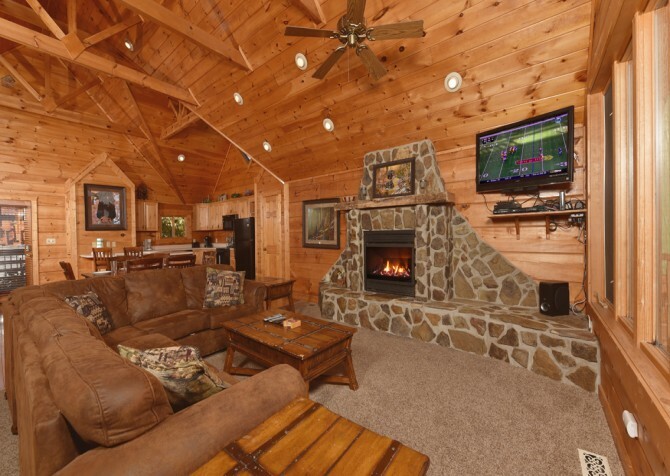 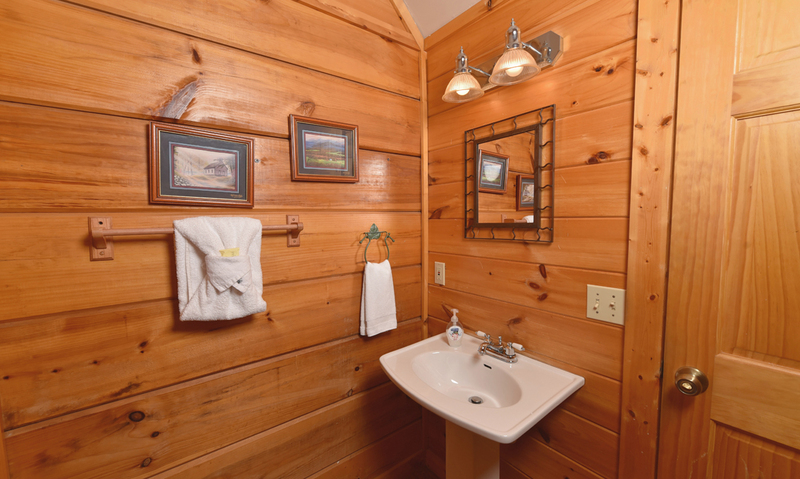 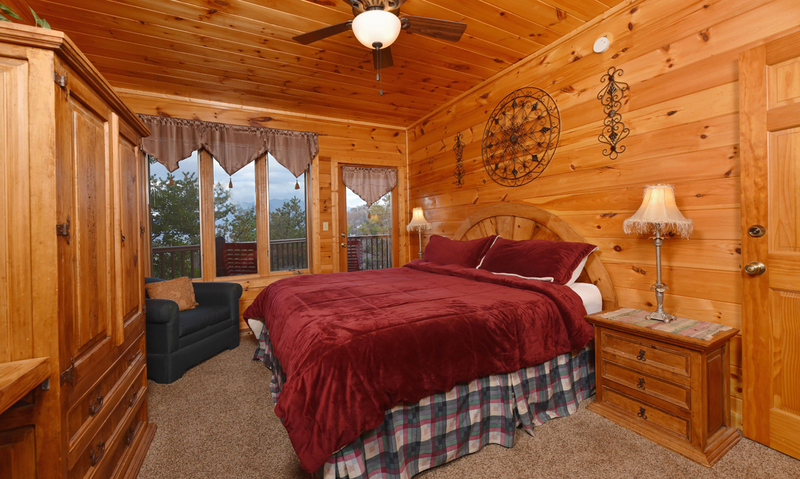 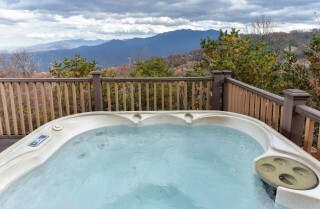 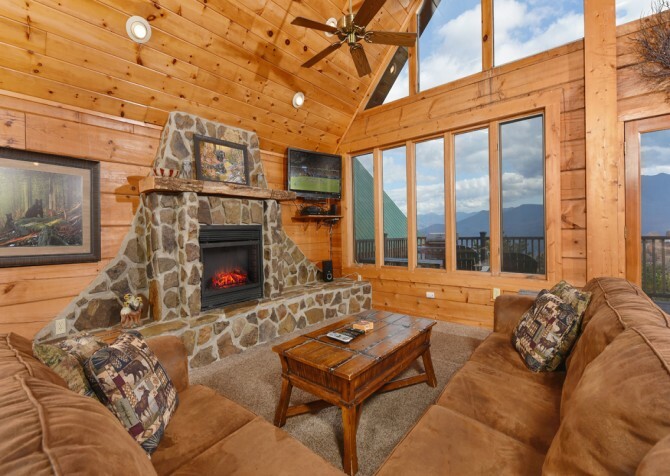 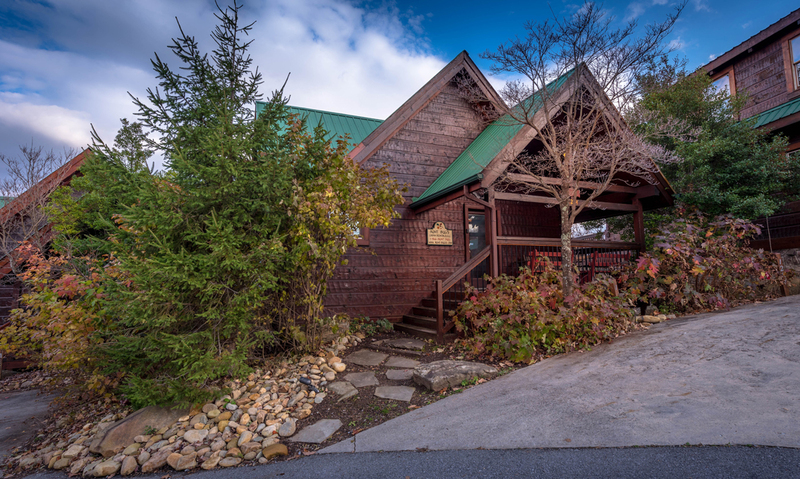 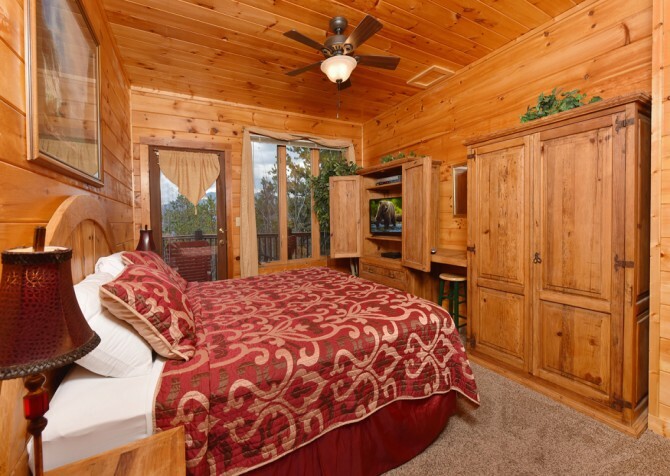 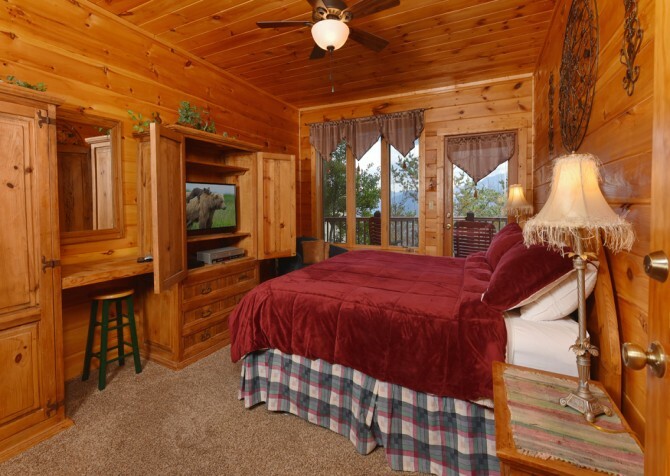 Situated in the charming Chalet Village cabin community in Gatlinburg, Tennessee, Eagle’s Nest is the perfect fit for a fun family vacation, a weekend with friends, or a getaway with a few couples. 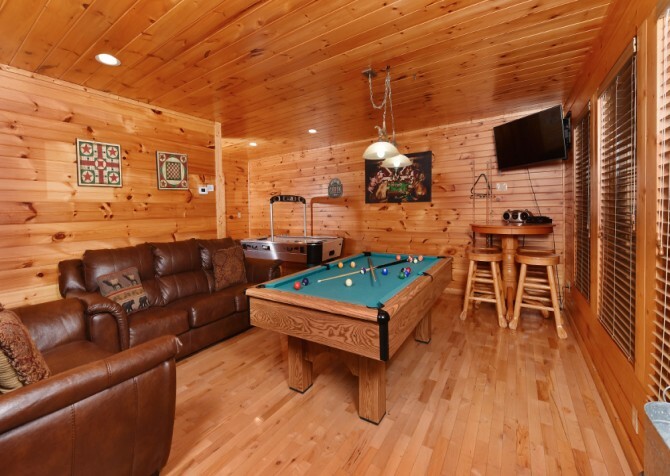 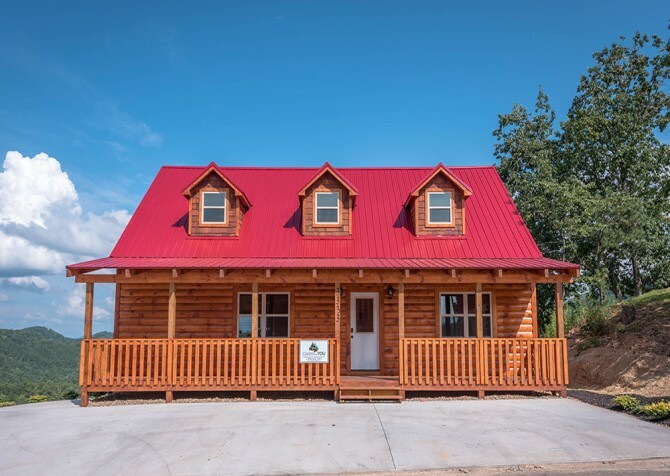 This 3-bedroom, 3 ½-bathroom, 2,000-square-foot cabin for 8 features king-size beds (along with a sleeper sofa), access to the community pool, and lots of great amenities throughout. 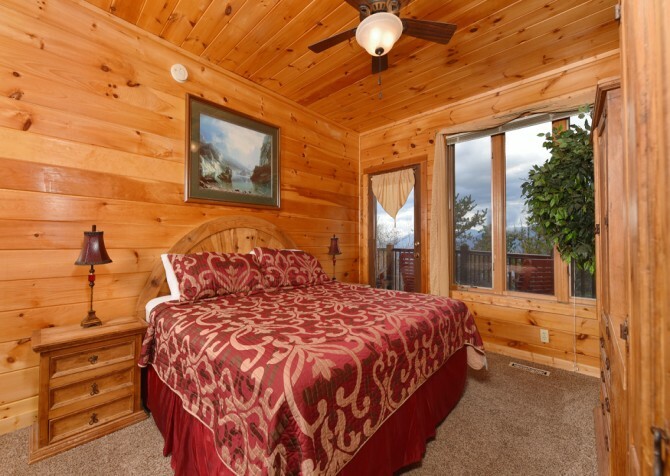 Sit back and soak in mountain views at Eagle’s Nest, where fun, convenience, and relaxation perfectly meet. Enjoy your morning coffee in the rocking chairs on the deck, end your nights with soothing soaks in the indoor jetted tub, or cozy up on the sofa for movies (DVD player provided) on the flatscreen TV! And don’t forget wireless high-speed internet, a convenience kids and adults can appreciate. Looking for some fun? 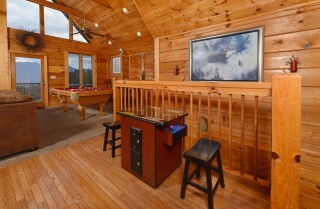 Shoot some pool or test your skills on the arcade games in the cabin! 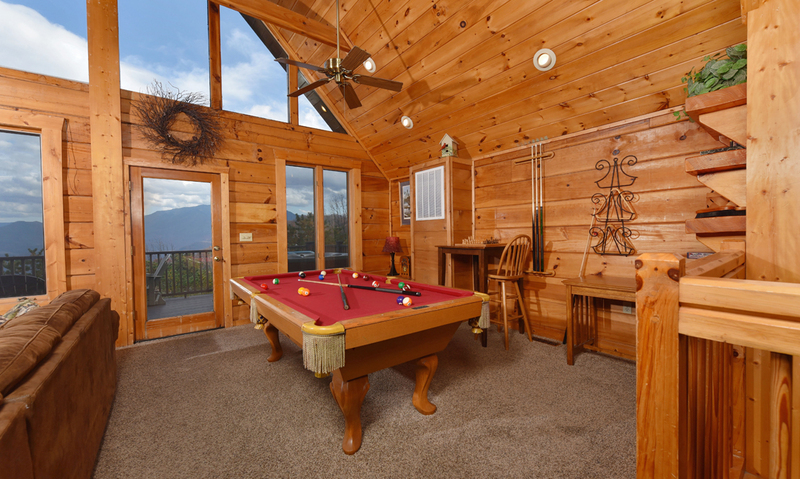 Or you can take the short drive to downtown Gatlinburg, where you’ll find endless opportunities for entertainment. 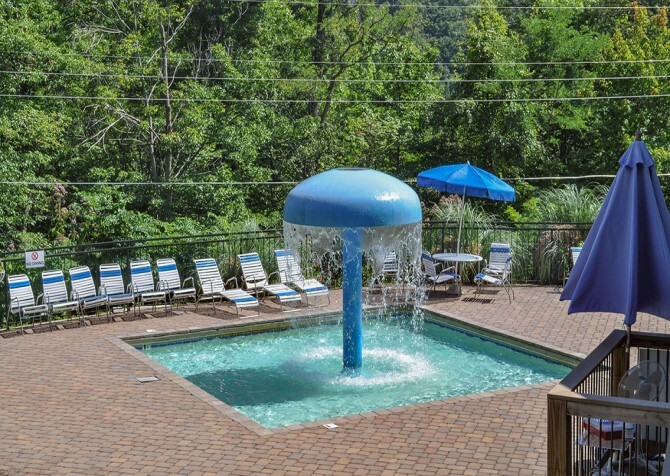 From mini golf, laser tag, and family-friendly attractions to art galleries, boutique shops, and annual events, there is always something to do near Eagle’s Nest. 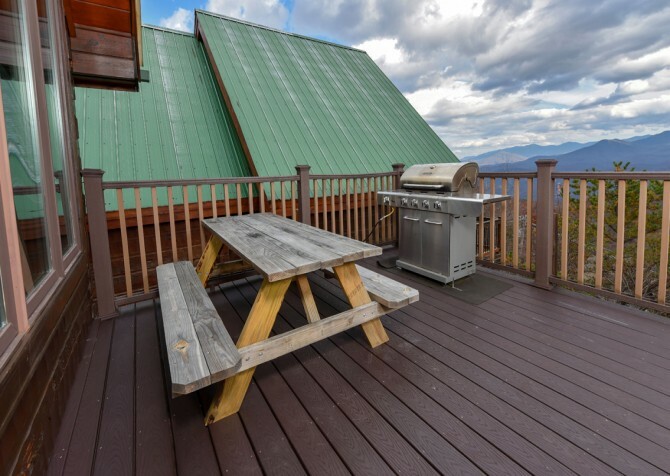 And for a laid-back evening at Eagle’s Nest, toss some burgers or kabobs on the gas grill and enjoy your peaceful mountain surroundings. 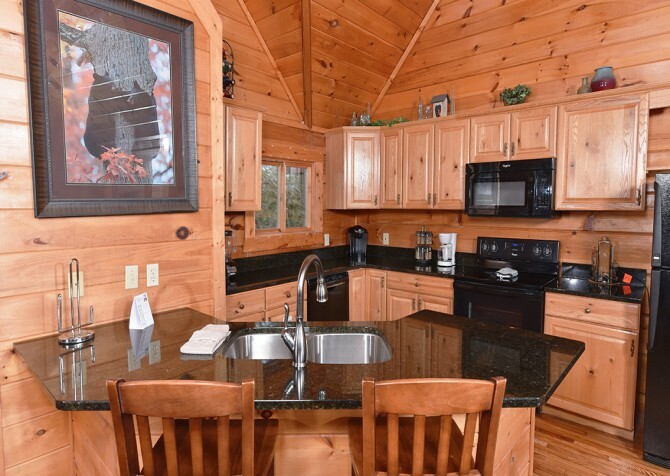 Add conveniences like a fully equipped kitchen plus washer and dryer, and you have a Smoky Mountain cabin that feels like home — but better! With a wall of windows streaming in majestic mountain views and gorgeous exposed beams overhead, you’ll be instantly drawn to the cozy living room at Eagle’s Nest. Leave your bags and the door and head on in — it’s time to get your well-deserved vacation started! Plop on the L-shaped sofa (doubles as a sleeper) and soak in the heavenly scenery while the kiddos pal around on the carpet and get out their travel wiggles. 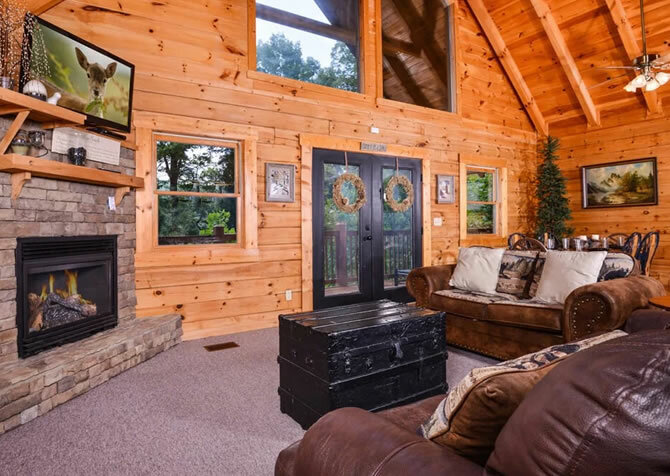 When the evening sun sets, flip on the flatscreen TV, pile snacks mountain-high on the coffee table, and pop in your favorite family DVD for movie night. After the little ones hit the hay, return to the toasty gas fireplace and stone feature for chats, card games, or a quiet read. Everyone’s favorite foodie space, the kitchen at Eagle’s Nest is fully equipped with major appliances, spacious granite countertops (NEW! 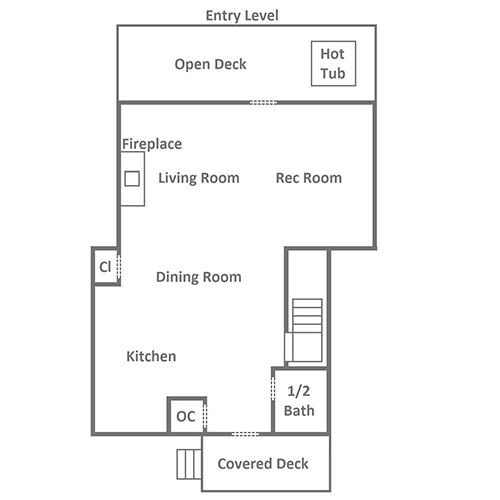 ), pots and pans, cutlery, mugs…you name it! 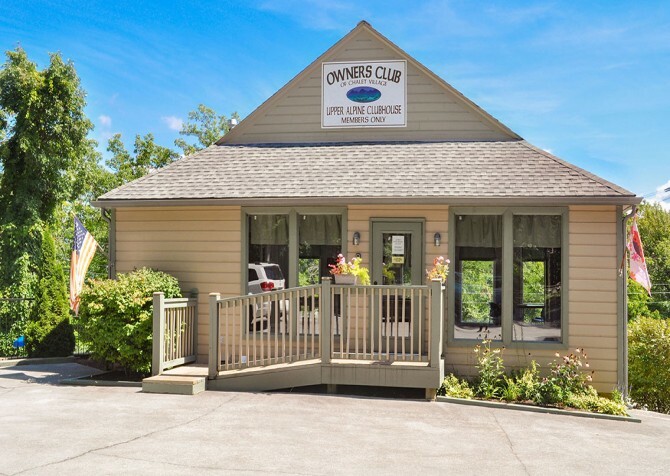 Grab ingredients in town, and you’ll have everything you need to whip up a festive holiday feast, homemade recipes, and fresh batches of cookies. Fix the gang hot breakfasts on the stove, rinse dinner veggies in the porcelain double sink, pop movie-night delicacies in the microwave, and brew endless K-cups of joe with the Keurig. The best part? There’s a handy dishwasher, so you don’t have to do the dirty work! Just off the kitchen, the dining area boasts a nice wooden table with 6 matching chairs. 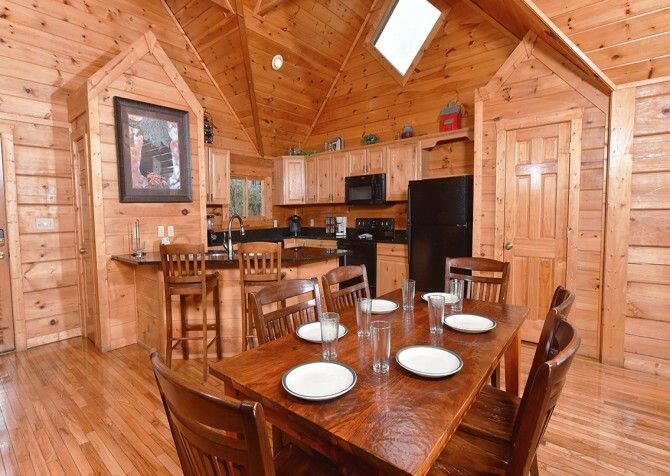 Plus, there’s extra seating for 2 at the kitchen bar nearby, meaning everyone can enjoy mealtimes together without missing a beat. 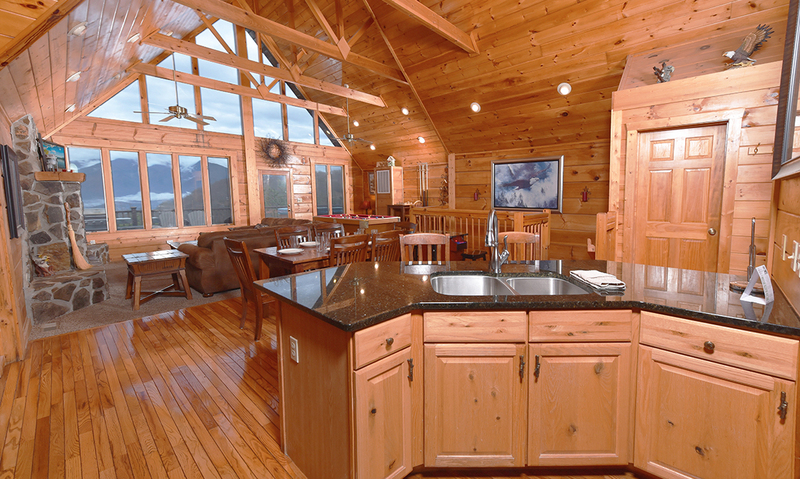 Plus, the open concept throughout the cabin keeps you within view of the lovely floor-to-ceiling windows with rolling Smoky Mountain hills just outside. 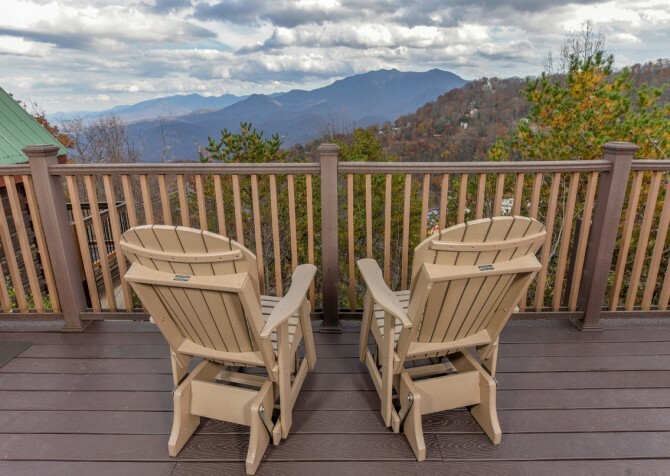 Cooking and dining at Eagle’s Nest is a truly elevated experience (literally). 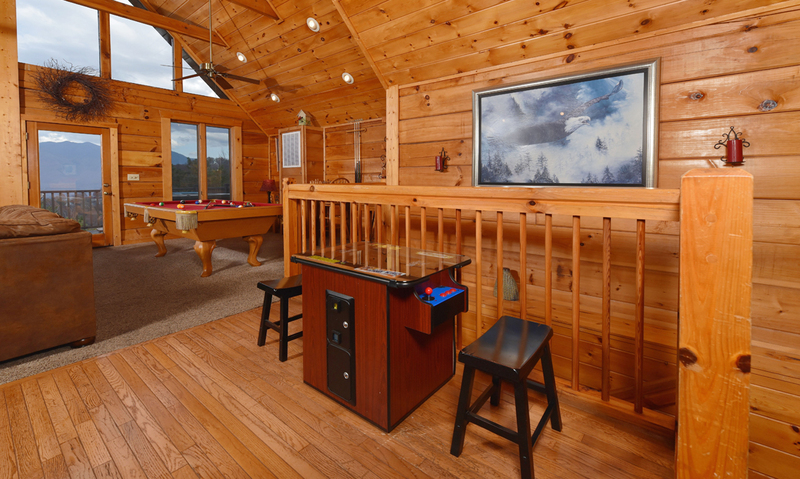 Near the living and dining areas, you’ll find not only a pool table and chess board but also a modern arcade table, which includes gaming classics like Ms. Pac-man, Frogger, Galaga, and Donkey Kong. 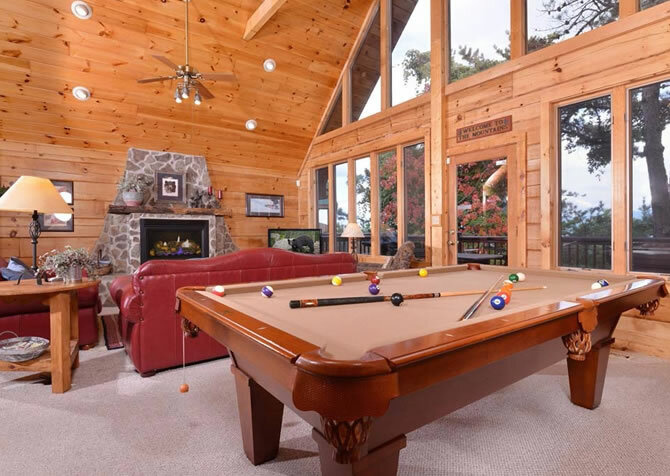 Host a game tournament with your best buds and show them your mad pool skills, then take over every digital high score at the cabin! Afterwards, give your bestie a taste of victory by letting them win a round of chess…or defeat all your friendly foes no matter the challenge (we won’t judge). After you’ve won every game and chilled in the outdoor hot tub for a bit, head to dreamland in a king-size bed in one of 3 bedrooms at Eagle’s Nest. As a bonus, every bedroom comes with a ceiling fan to keep cool and a flatscreen TV for entertainment, and 2 bedrooms include a vanity plus direct deck access. When the morning sun rises, hop in a large tiled shower for a steam, then head onto the deck for tranquil views with a hot cup of coffee. 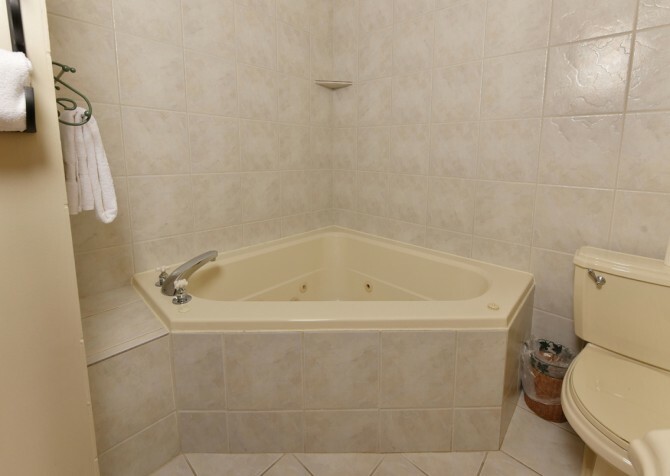 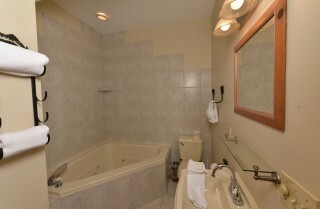 There’s also an indoor jetted tub in the cabin, meaning spa baths are never far away — morning, noon, or night! 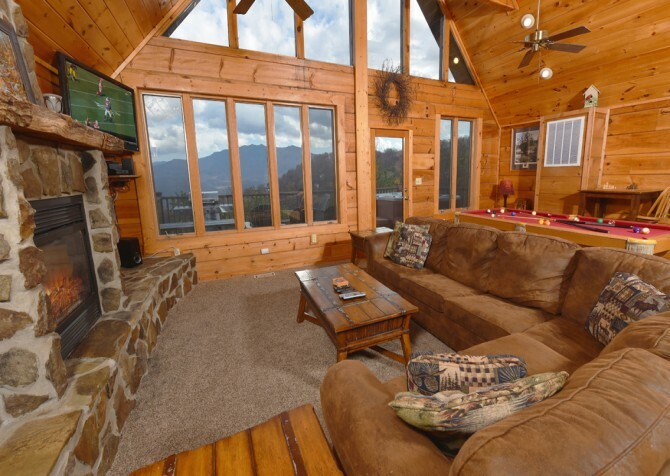 And if a total of 8 guests decide to stay, you’ll really appreciate the sleeper sofa in the living room, where the best mountain views at the cabin await! 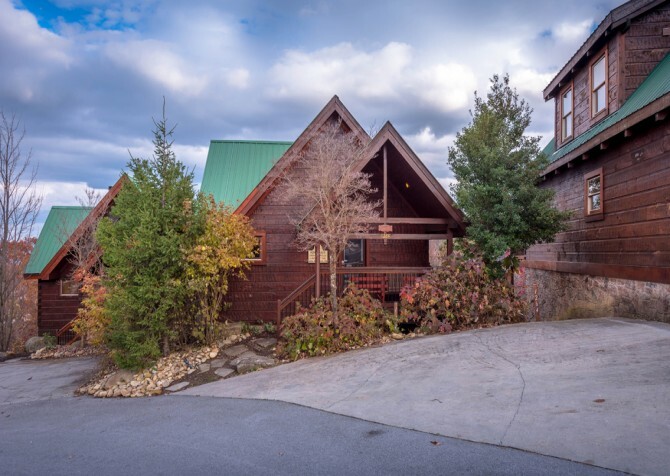 Pull into the paved, curvy, and steep driveway (with parking for 2) at Eagle’s Nest, then follow the stone path to 5 easy stairs into the cabin. 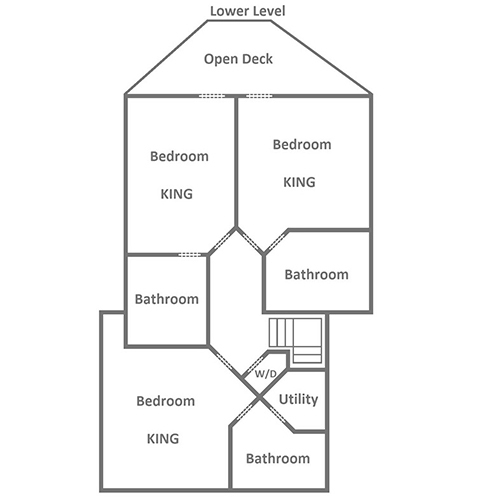 Now head straight to the entry-level deck, where you’ll find stunning mountain views as far as the eye can see. 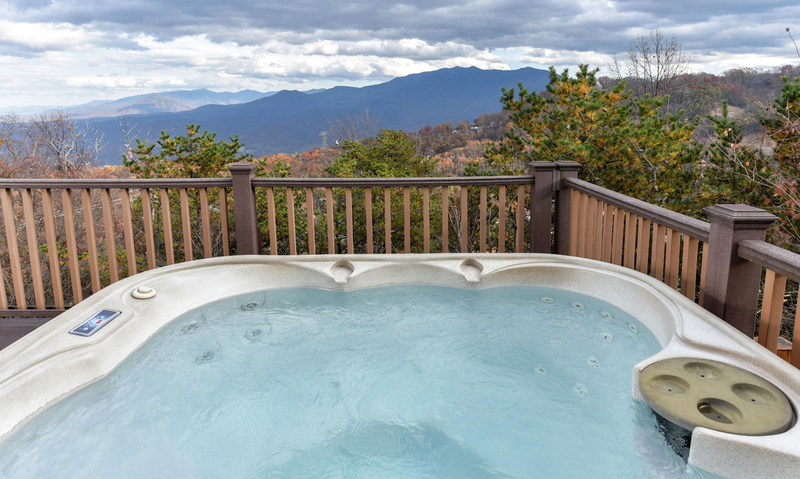 Unwind in the gliding chairs with a glass of sweet tea in summer or hop in the bubbly hot tub for a winter soak. 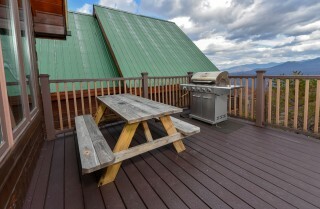 There’s also a gas grill and picnic table, perfect for barbecue shindigs. 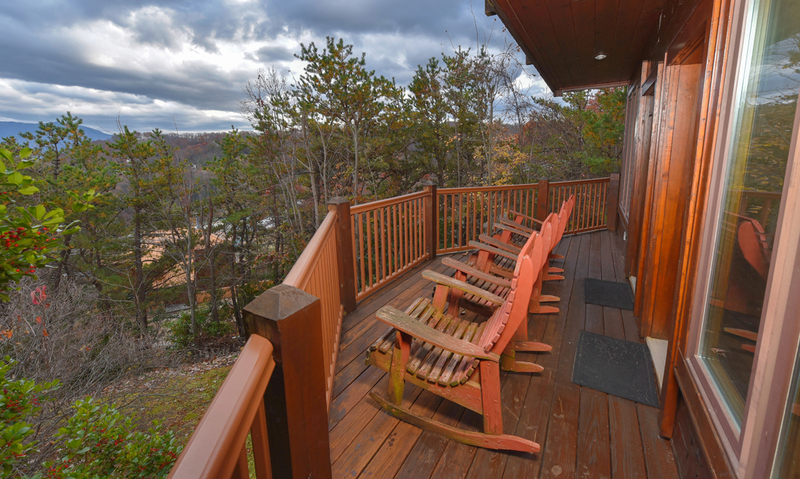 Play your favorite tunes, dance the night away, and make memories to last a lifetime outdoors at Eagle’s Nest! 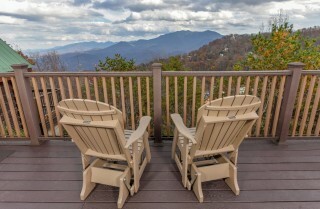 And let’s not forget the lower-level deck, a great spot to start the day with natural views from the rocking chairs. 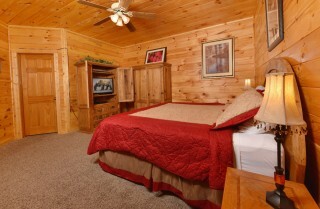 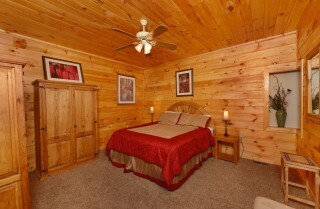 Of course, Eagle’s Nest wouldn’t be the great cabin it is without a few extra perks for valued guests like YOU! 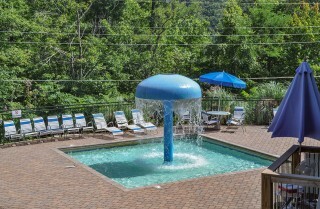 Located in the Chalet Village Resort, you’ll have access to the community pool for summer splashes. 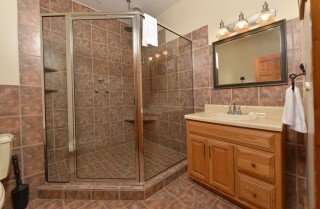 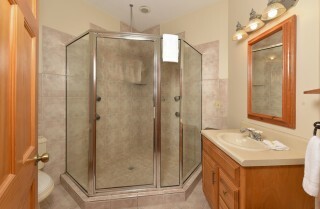 Plus, the cabin comes with a washer and dryer to keep clothes and towels fresh throughout your stay. And the high-speed wireless internet keeps you connected with family and friends. 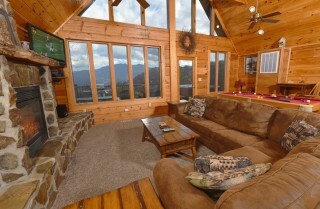 After seeing all the photos and videos you send, they’ll be sure to make time for a Smoky Mountain vacation next year! A great convenience, Eagle’s Nest is less than 5 miles from the hustle and bustle of downtown Gatlinburg. Play at local attractions, experience fine Southern dining, and shop until you drop! 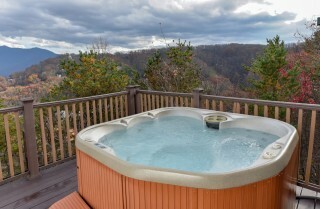 Playful penguins, soaring stingrays, gorgeous sharks, and wonderous sea life await at Ripley’s Aquarium of the Smokies. 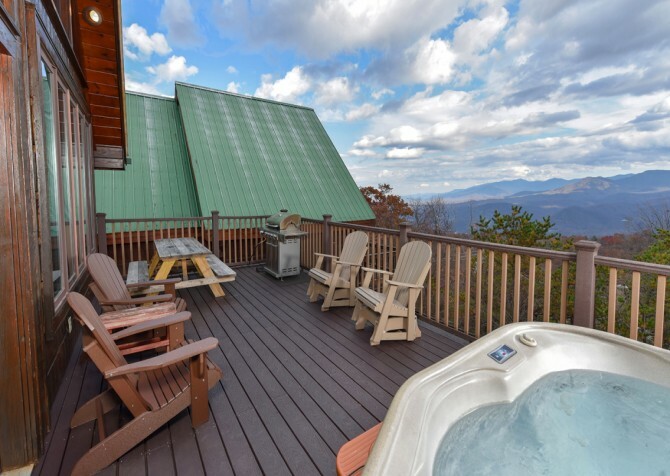 Who says you can’t visit the ocean in the mountains? Sip some good Ole Smoky Whiskey made within carefully curated barrels for the best flavors at the Ole Smoky Whiskey Barrelhouse.